Well, currently it's only one strategy, but I'll probably develop more as I get more experienced in trading. The strategy I'm using now is a spin-off of the 'Cowabunga' system, as read on babypips.com, and it is based on short-term trading. This system is easy to understand and is surprisingly pretty accurate. However I believe that the twist I put on this system happens to be even more accurate. Unfortunately there is not one trading system out there that is 100% correct. If that was the case we FOREX traders would all be rich by now! * another 1 minute chart with a EMA showing set to close @ 10 and close @ 5 (both must be showing and if you're able to color code it do so since it's easier to read on the chart), I also have a MVA showing of 20 showing on the same chart, however I don't use this in my strategy (yet). example; this example I just snapshotted (if that's even a word) from my trading platform and shows 1 of the screens. as you can see how the green (5 EMA) crossed over the red (10 EMA) in the first circle. 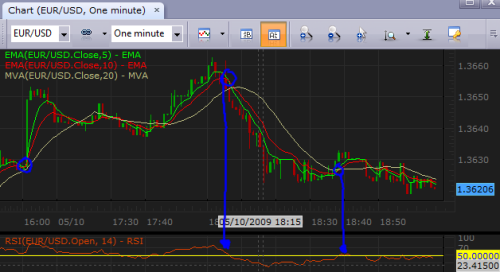 The opposite happend in the second circle (look at the RSI, it crossed back under 50 signaling an overbought market) the third blue circle RSI is greater then 50 but very weak. I'm short in this trade, whether I entered a short at the 1st, 2nd (ideal) or 3rd circle, with my stop-loss set to 30 I'd have a profitable trade. Remember, this trading system is short-term, that's why you need the 5 minute chart open to see what the general direction of the trend is. If the 5 minute chart shows a bullish trend, use caution selling the currency short. The same is for the MACD (this is on the 1 min chart), this shows you what trend is forming in the current setup. This is my trading system for now although I'm still working out a few flaws (maybe find a better use to the MVA). Stick to the system, trading rules can be broken but doing so you will a) most likely lose, and b) you will never figure out what you did wrong in your system so you can correct it.